One could view Sopra (it means ‘above’ in Italian) as being the tardy dinner party guest who ends up bringing something different – and refreshing – to the table. In this case, it’s rustic Sardinian fare by chef Simone Depalmas. A native Sardinian who’s never set foot off the Mediterranean island until now, he presents authentic dishes untainted by the dining scene’s obsessiveness with tailoring food to the local palate. Whether this works is perhaps dependent on how open-minded Sopra’s diners will be, but you certainly can’t fault the effort. 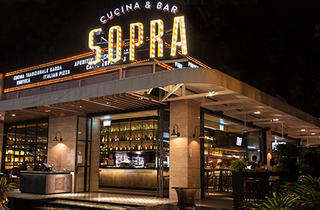 While the location – just off the main shopping belt, tucked behind Orchard Towers – isn’t the most desirable, the handsome 230-seat premises make up for it with the bright movie-style signage, post-war Italian furnishings and curated antiques like the lovingly-restored wooden abattoir table in the middle. With a list of untranslated Italian dishes, the menu can be intimidating to navigate (though one way to avoid it completely is to go for the four-course Sardo degustation menu, $98, minimum two persons, which leaves it up to chef Depalmas to choose for you). Regardless of what you select, you’ll likely come across pecorino cheese – the mainstay of most dishes at Sopra – in delightful variations. As a starter, it’s in the biscotto di pecorino ($22), encased and baked in crispy, paper-thin carasau (music bread) with a liberal drizzle of honey that’s best eaten straight away. Then there’s culurgiones ogliastrini ($28), the Italian version of a Chinese dumpling stuffed with a surprisingly light and delicate filling of potato, mint and pecorino. Dessert’s not spared either, with the seadas ($15), a traditional hollow Sardinian fried fritter lined on the inside with the recurring cheese. Pastas – heavier cheese or butter-based sauces are eschewed here – are a revelation here; say hello to fregolas ($29), pleasantly chewy and bouncy orbs in a fish broth topped with scallops and the Melloreddus alla Campidanese ($26), oddly-shaped but perfectly al dente semolina pasta in a slightly gamey pork and rosemary sauce. 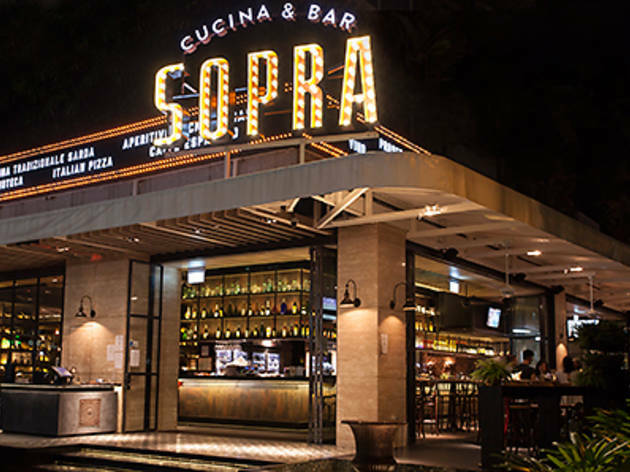 Not everything was spot on: Sopra’s signature thin crust pizzas were hit and miss – the premium King pizza ($57), topped with caviar, cream and salmon, was excessive; try the simpler Sopra original ($36), with parma ham and fresh tomatoes, instead. The crispy roasted suckling pig ($48) contained too much un-rendered fat for our liking as well.